The tribe started with a man, a Patriarch by the name of Benjamin. He was the least-born son of Jacob, born last of all his twelve sons. He was the only son that was born in Palestine. All the other sons (and all the daughters as far as we know) were born in Mesopotamia in the area adjacent to or in association with Babylon. He was also the son of Jacob’s old age. Jacob was well over 100 years of age when Benjamin was born. The record of Benjamin’s birth is in Genesis chapter 35. Rachel was with child on the road back from Paidenaram in Mesopotamia on the road to Palestine. Jacob’s family was some 10 miles north of Jerusalem. There was not any city of Jerusalem at that time, it was a Canaanite city called Jebus. Rachel began to have her labor pains: “And they journeyed from Bethel; and there was but a little way to come to Ephrath” (Genesis 35:16). Ephrath is Bethlehem, south of Jerusalem. When it says “a little way” it means “on the way” or still some distance to go on the road to Ephrath. Just south of Bethel Benjamin was born. Benoni means “the son of my sorrow.” Or it can be translated “son of my iniquity.” Perhaps that is the closest to the Hebrew, but it is not a good name as far as the understanding of it is concerned. It is either “sorrow” or “iniquity.” Maybe she was in an iniquitous position of some kind, but maybe that is not what is meant at all. Certainly she was in great sorrow giving birth to this baby and perhaps that was the reason she named him as she did. His father Jacob did not like that name; he called him instead Benjamin. “Ben” means son. “Yamin” means “right” or “right hand,” son of my right hand, my right hand son, the man who will be next to me. That is a very fine name. The Bible shows that Benjamin was the last born of Jacob, who was over 100 years old at this time. Benjamin did not have a mother although he had a stepmother, his aunt Leah, and the two concubines. I suppose Benjamin was found most of the time with those women. Not having a mother was perhaps a problem that Benjamin faced in his early age. Benjamin did not grow up to be a very nice boy, to be honest about it. When we look at the early history of Benjamin we find he had a prophecy given to him that was not all that good. He was to be rather like a rapacious animal that would tear and divide the spoil. Genesis chapter 49 shows the character of Benjamin, and undoubtedly it was meant to illustrate how the tribe would act in later times. (1) He had no real mother to care for him. Maybe that was why in the early part of his life and the earlier part of the tribe, he did not fare very well. From a religious point of view he was about the lowest on the list. (2) He had a father well over 100 years old. A father needs to be younger to care for a child properly. I am 42 years of age now [in 1974] and I hope my wife and I do not have more children. I do not know if I could deal with them. In Jacob’s time they were marrying at 25 and having children at 25 and 30, and I can prove it. That is when Jacob should have had his children. Jacob did not marry until he was 86 years of age. That staggers most people, but it is a fact. Most people were marrying much earlier. Maybe that was one reason some of Jacob’s children did not turn out good at first. It might be one reason why Benjamin did not turn out all that good. He was born when Jacob was well over 100 years old, and I do not think his father, being that old, could care for a young child. It would have been very difficult for him to do. (3) Rachel was his favorite wife. She was the wife Jacob wanted from the beginning. He did not really want her sister Leah. I am not sure that he cared that much for the two concubines. I guess he cared for them enough; four children were born of them, but the one that he loved most was Rachel. The history of Benjamin shows that he would fulfill that prophecy very early in life. Go to the Book of Judges and turn to chapter 19. This period of time in the history of Israel was not a good period. All types of difficulties were taking place. Many people left the ways of God. They were beginning to go into their own ways. The period of the Judges was a chaotic period in Israel and all the tribes shared in the difficulties. “And it came to pass in those days, when there was no king in Israel, that there was a certain Levite sojourning on the side of mount Ephraim, who took to him a concubine out of Bethlehemjudah [about 5 miles south of Jerusalem]. And his concubine played the whore against him, and went away from him unto her father’s house to Bethlehemjudah, and was there four whole months. The story goes on to say that he had quite a rapport with his father-in-law. He wanted to leave and go back north with his concubine, which by the way was his wife, a type of binding relationship. This man was her husband and her father was his father-in-law. 3 They had a rapport with one another and he wanted to depart on the morning. It says in verse 5 on the fourth day, and his father-in-law did not want him to depart. So they stayed a little longer. When he rose up on the morning of the fifth day (verse 7) her father still asked them to stay on. They must have gotten along very well. Finally the Levite said he had to go north. The Levite would not stop in Jebus. I suppose his reason was because he knew that the Canaanites were evil. They were not only idolaters but they were evil as far as social practices were concerned. He wanted nothing to do with them, so he says in verse 12 “we will pass over to Gibeah.” Let us go another 3 miles north. They wanted to go to either Gibeah or Ramah, because their populations were relatives, Israelite brothers. They went into Gibeah and no one could lodge them. This is the first point concerning the Benjamites. They were not hospitable. He was a priest, a Levite, someone that should have been taken in. They knew he was a Levite; from the distinctive garb that a Levite wore. The House of YHWH at that time was at Shiloh about 20 miles north of Ramah in Mount Ephraim. The Levite took nothing from this exiled Ephraimite, even providing feed for the old man’s animals and food for his servants. But the author of this section of the Bible is making it clear that the old man helping the Levite was not a Benjamite. He was an exiled Ephraimite living in the town. 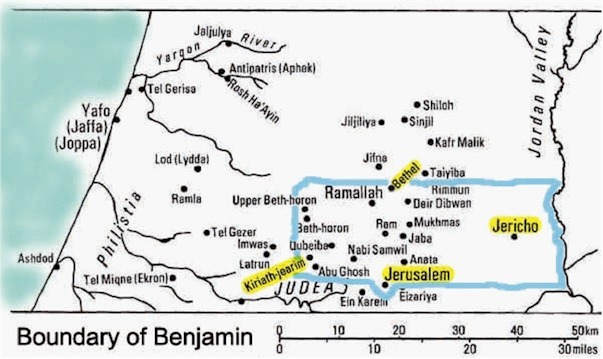 What will happen to the Benjamites living in the capital of the tribal area of Benjamin? Just like Sodom and Gomorrah, the Benjamites use the same words when the angels stayed with Lot in Sodom. The people beat on the house doors then too. You know what happened there. Those cities were destroyed from the face of the earth. Here are Benjamites, not long after entering the land of Canaan, and look what debaucheries they were getting into already. Were they ravening like a wolf? But the men would not hearken to him: so the man took his concubine, and brought her forth unto them; and they knew her, and abused her all the night until the morning: and when the day began to spring, they let her go. Then came the woman in the dawning of the day, and fell down at the door of the man’s house where her lord was, till it was light. This was a barbaric act, certainly, but he wanted to make an impression upon the rest of the tribes of Israel. He even sent a piece to the elders of the tribe of Benjamin. The next chapter shows that the children of Israel, when they received the pieces of this concubine with a note explaining what happened (it was a gory thing), they became upset with the entire tribe of Benjamin. Mizpeh was west of Gibeah about 2½ miles. They assembled their armies around Mizpeh because they were going to teach the Benjamites a lesson, especially the people who had done this abominable act. They were angry with the Benjamites. They attacked the Benjamites when they would not give up the rebels, these “sons of Belial.” The Benjamites, however, were in their own territory and the other tribes did not know the lay of the land. The Benjamites beat them. They tried it again and the Benjamites beat them. They rallied their forces a third time and they conquered the Benjamites. They were so angry that they devastated them. They began to kill so many Benjamites throughout the region that they practically wiped out the entire tribe. Only 600 men of Benjamin were left from the whole tribe. These 600 fled to the Rock of Rimmon about 10 miles from Gibeah, and hid themselves there. They did not like the people of Benjamin (and remember this was not long after the time of Joshua). Benjamin had deteriorated to such an extent that the other tribes said they would not give their daughters to them. They could not stand these people. Something in their character was wrong, something was evil. Was Benjamin growing up? The boy was a juvenile delinquent. The patriarch Benjamin had died, but his descendants followed in his footsteps, undoubtedly. They came out of Egypt with Moses and the rest, and went into Palestine with Joshua. But look what they are doing some 20, 30, or 40 years at the most after they entered the land of Promise. So all Israel went against Benjamin to wipe them out. Only 600 were left (Judges 20:47–48) and they fled to the Rock of Rimmon, living there for 4 months. In other words, who did not fight with the tribes when they attacked Benjamin? They would not give any of their daughters to these 600 men because they were evil Benjamites. Yet they asked how could they save the tribe of Benjamin? They discovered a city on the other side of Jordan (in Jebeshgilead verse 8), that did not come to the battle or to Mizpah when they attacked the Benjamites. The order given over all Israel was that everyone had to send delegates to fight the Benjamites. The city of Jebeshgilead did not come to the assembly. In Judges 21:8–11 they went to Jebeshgilead, in the area of Gilead in the ½ tribe of Manasseh, a city of Joseph. 5 Perhaps they did not assemble because of their close brotherly relationship with Benjamin and they did not want them wiped out. The army of Israel met at Jebeshgilead, attacked the city, and destroyed it. They killed the men, captured and took the women to Shiloh for a feast. This is a silly way of doing it from our understanding, but that was what they did. They took the 400 virgin women rescued from Joseph and brought them to the feast at Shiloh. They then let the 600 men take those 400 virgins. They could not give their daughters to them; they had made an oath. The 600 men took wives from the 400 virgins of Manasseh. The tribe of Benjamin was still “of Rachel” because Jebeshgilead was of Manasseh of Joseph, and close to one another. That was how the tribe of Benjamin was saved in the time of the Judges. Those three chapters were given to show the characteristics of the tribe of Benjamin. I ask this question, were they ravening as a wolf? Were they going out and dividing the spoil at night, and were they doing the things that a wild animal would do. The answer is yes. They were fulfilling the prophecy. There is, however, an air of redemption even in the prophecy of Moses about Benjamin. He seemed to see that some time in the future there might be some redemption for them because in Deuteronomy chapter 33, just before the Israelites entered the land of Canaan, Moses gave a prophecy, a rather enigmatic blessing for Benjamin. People did not know how to interpret it. Later we will see exactly how to interpret it. That was all that Moses said. What does that mean? It has a ring of redemption coming to Benjamin at some time in the future. Normally Benjamin was to raven as the wolf, and that was exactly what he was doing in the period of the Judges. After the period of Judges was over Israel came to kingship. Saul was able to do a number of things for Israel. He extended Israelite territory almost to the River Nile. Israel carved out a kingdom that was powerful by the time of Saul’s death (although defeated by the Philistines). When Israel became united and extended their territory it was done under the leadership of a Benjamite. Was God pleased with the Benjamites, or with Saul? Again the answer was no. God had in mind another king who was to come from Judah. That was King David. Under King David Israel’s territory extended to the River Euphrates in the north. Interestingly, at the time of David, because Benjamin had 40 years experience as king to Israel it should have sought to supply kings to the 12 tribes of Israel from then on. But God removed the Benjamites out of that office and gave it to Judah. That was sort of a slap in the face to Benjamin. I imagine that some of Benjamin were upset about the whole matter. On the other hand, at the time of David something happened to the tribe of Benjamin for good. It seems like if you personify Benjamin from his birth, and view his growth as a tribe, and go to the very end of the New Testament, something happened to Benjamin at the time of David. We could say that Benjamin became truly converted for some reason at the time of David. Why is it that Benjamin at that time came out of his juvenile delinquency and then became converted? I suppose the reason was because God said it was going to happen. Reread Deuteronomy 33:12. Was this why Benjamin, personifying the tribe, became converted near the end of David’s life? Something holy was to be placed within the territory of Benjamin and that tribe was to be associated with that holy thing. As I said, Deuteronomy 33:12 is an enigmatic prophecy, but when people find out what happened in the days of David, this prophecy becomes clear. David in the latter years of his reign numbered Israel (2 Samuel chapter 24). That was one of David’s final sins. For the last 3 years of his life, however, from 67 to 70 years of age, what did David do? He devoted his whole life to getting materials ready to build the Temple that was to be on the north side of Jerusalem on the threshing floor of Araunah. King David spent 3 years of his life gathering all of that material (1 Chronicles 22:14–16). He would have built the Temple himself but he had been “a man of war and had shed blood,” God said (1 Chronicles 28:2–3). David died and he left to his son Solomon, who was of Judah, the task of building that Temple. Thus, the whole city of Jebus fell within the area of Benjamin, not in Judah. The Temple site was in the center of the city of Jerusalem in the highlands, the shoulder lands of Palestine. In the midst of the shoulder of Palestine the Temple of God was to be placed. The line that separated Judah to the south from Benjamin in the north, the valley that separated them was Gehinnom (Gehenna). All of Jebus was in Benjamin. 8 Jebus was conquered by King David. When he took Jebus, on the southern edge David made his citadel called the Citadel of Zion. Then in his 67th year when he numbered Israel and God sent a plague upon Israel, from that time on he began to build up the area just north of the City of David on the threshing floor of Araunah in the height of the land of Benjamin. Now go back to that prophecy of Deuteronomy 33:12. Once we know what happened some 400 years after Moses, this prophecy becomes clear. Where is “the fountain of Israel”? What is the source of Israel’s strength? The Temple, the sanctuary of God. That word “with” is in italics which means it is not in the Hebrew. If you take out the “with” it says: “There is little Benjamin their ruler.” This is talking about the Temple, the sanctuary. “My King, in the sanctuary” was not David or King Saul. God was in the Sanctuary. Where was the ruler? Verse 27, in “little Benjamin,” the smallest of the tribes, almost wiped out; it was also the smallest in land are that was given. Yet within its territory was to be the Temple of God from where He would reign and dwell. When the prophecy in Deuteronomy 33:12 says that God will dwell between Benjamin’s shoulders, it was as a sign of redemption. With the Temple built in Benjamin, it seems there was a conversion taking place with this whole tribe of Benjamin. From that time forward nothing but good is spoken of Benjamin. Whereas before it was all bad and evil in the extreme like Sodom and Gomorrah, when it comes to the Temple being built in Jerusalem in the shoulder of Benjamin, the whole tribe seemingly comes to conversion. It is out of its teenage rebelliousness, it has come of age and from now on you see blessing after blessing coming from Benjamin. After Solomon built the Temple Jerusalem became the central headquarters for all of Israel. A Davidic dynasty of Judah had been established, not a Benjamite dynasty, one which was to last for all time to come. Out of that dynasty was to come the rulers of ancient Judah — and Christ in particular. At the death of Solomon there was a great squabble in ancient Israel over the kingship. Solomon’s son Rehoboam was the one, apparently, to rule over the whole nation at first. However, another man, an Ephraimite up north who had fled to Egypt escaping from Solomon because he was a rebel from the very beginning, apparently, his name was Jeroboam. 10 He made many Egyptian friends with Egyptian ideas. The Egyptians were becoming strong at this time. The 18th Dynasty was in existence. Jeroboam returned from Egypt, went to the northern territory of united Israel, where he and his supporters began to make demands upon Rehoboam. They said lessen the taxes that King Solomon placed on us. Rehoboam’s older advisors said you had better do it if you want to retain your kingdom. His younger advisors said, no, don’t do it. As Solomon scourged them in one way, you should double their taxes. Rehoboam’s young advisors prevailed and he put on excessive taxation. Jeroboam and the ten tribes of Israel in the north revolted against Rehoboam in Jerusalem and established their own kingdom called Israel. The nation in the south under the control of Rehoboam was known as the Kingdom of Judah. The interesting thing is this, relative to the tribe of Benjamin, when the two nations split in two, Israel up north under the leadership of Ephraim which was the top tribe of Joseph and a close brother to Benjamin, you would think Benjamin would have gone with Israel. They had every advantage to do so. First of all, if they stayed with Judah in the south (which they did) they would be turning their back on their natural brethren, the Ephraimites and Manassites who were leading Israel in the north. They turned their backs on that. Also, Benjamin was the first tribe to have kingship in ancient Israel. If they had stayed with northern Israel, there are indications in the Bible that the kingship could have come back to them. After all, they had established the precedent with Saul, and they liked the Benjamites from that point of view. But no, they turned their back on kingship with the northern tribes. The northern tribes were 10 in number. The southern tribes were only 2 in number (some of the tribe of Simeon may have been down there making 3 in number). The northern tribes were far stronger and if Benjamin had joined the northern tribes, they probably would have been able to rule them. They might have been able to make Jerusalem their capitol, and in a short time, so it would seem, they would have controlled all Israel and Judah again by pressuring Judah in the south, a minor kingdom at this time. They did not do so. Every advantage would have come to the Benjamites if they had gone with their natural brother Ephraim and Manasseh controlling the northern 10 tribes, but they turned their back on the natural and stayed with Judah. I will tell you why they did so. This was a type of conversion. They abandoned their own family, their own brothers, to go with God because they knew that God had established in David, in Judah, a dynasty that was to rule all of Israel. The Temple was in their territory. It was theirs. God had blessed them with that, and perhaps because of their “conversion,” if you want to put it that way, knowing that this was God’s will, they turned their back on their natural brethren and went with Judah and Jerusalem. They might have had the natural blessing of kingship restored to them if they had gone the way of the flesh, so to speak. They knew they had no kingship whatsoever with Judah, and no Benjamite ever gave rise to rulers from that time forward. They went with Judah and with the House of David. Also, if they had turned their back on Judah they would undoubtedly had greater riches because there were 10 tribes in the north, and only two in the south. They did not do so. They turned their back on the natural and went toward the spiritual. Benjamin became a part of the kingdom of Judah when it should have gone the other way. From then on in Benjamin’s life we can see almost a Christian type of attitude, one who has changed from being a juvenile delinquent, even a Sodomite, as the early Benjamites were. Here was a time when great physical blessings could come to them if they would just go the way of the world. Benjamin turned his back on all of that, and stayed with God in Jerusalem. He stayed with the minor kingdom. From this time forward Benjamin stayed with the House of David. Read all of 1 Kings 11:26–40. This is an interesting section where it speaks about Jeroboam and how he took away 10 of the tribes and established his own kingdom. God had a different thing in mind for Benjamin. I quote portions here. The one tribe to be given to Judah was Benjamin. So God was in this. God was going to give Benjamin to the tribe of Judah. The prophecy said that Jeroboam was to rule 10 of the tribes. The one tribe that was to go with David was the tribe of Benjamin. Notice that back in verse 36, the tribe of Benjamin was to be “a light always before me in Jerusalem, the city which I have chosen to put my name there.” Does this mean that the tribe of Benjamin was to be the light to the House of David? That the tribe of Benjamin had some good characteristics about it that would help David continually, help the Jews, and be a light for them and to them? That is a possibility. In the time of Jehoshaphat years later we read about this light still being in Jerusalem. Perhaps this light was the tribe of Benjamin. It seems to read that way. Was the light the tribe of Benjamin? It could be the House of David itself that was the light. But the light is associated with the tribe of Benjamin when one tribe was to be given to David, so that it would be secure. Still later, in the time of the son of Jehoshaphat, when Judah was in danger of being destroyed, the light was still there to help Judah which was not destroyed. It continued on for some time to come. Was the light the House of Benjamin? If so, it does make some good sense. Go on farther to the end Judah’s existence in the land of Palestine. We know the later history of ancient Israel, the northern kingdom. They had 9 dynasties down to Hoshea the last king of Israel around 721 BC when Israel was taken captive by the Assyrians. That was the end of the Kingdom of Israel up north. Judah centered at Jerusalem from Rehoboam’s time had its ups and downs, but it carried on past the time of King Hoshea in Israel down to King Zedekiah when Judah was finally taken captive into Babylonia. This is a prophecy here about the destruction of Judah and Jerusalem, but in the midst of this Jeremiah gives a promise to the Benjamites that they can flee from this destruction if they wish. As it happens they did not flee, they continued to stay with Judah, as they stayed from the time of David onward. They were undoubtedly “a light” to Judah. They were helping Judah time and time again. When Judah was finally destroyed by Babylon, Benjamin still did not abandon its role of being close to Judah for salvation sake. What happened? The Babylonians captured Jerusalem and the people of Judah and Benjamin were captive for 70 years in Babylon. After 70 years they came back and began to settle the area once more. This was in the time of the Persian Empire. During that period an incident occurred in which almost all Jews were threatened with complete and utter destruction by the wicked intrigues of a man called Haman. Turn to the Book of Esther. We will find that this Esther, the subject of her book, had as her uncle a man named Mordecai. Mordecai and Esther were in the king’s court in Susa in Persia. Also at the king’s court was an Amalekite man called Haman. Read the short Book of Esther for yourself. Haman intrigued to have all Jews destroyed on the 13th day of the month of Adar. Every Jew in all 127 provinces of the Persian Empire was to be wiped out. That is what the Book of Esther is about. Mordecai and Esther were both Benjamites. The entire Jewish nation was saved by the strategy of Mordecai and Esther. If it would not have been for Mordecai, who was the prime minister of the Persian Empire at the time under the King, and if Queen Esther had not been there to save the Jews, there would not be a Jewish nation and people today. Laws coming from the mouth of the Kings of the Medes and Persians could not be thwarted. They had to be carried out. Haman, who concocted the plan of extinguishing the whole Jewish nation as a tribe, was hanged on the gallows he had made for Mordecai. All of his children were hanged there, and the Jews were able to fight for themselves on that particular day when they were all supposed to be killed. The Jewish nation was saved again through the actions of a Benjamite and a Benjamitess. When Benjamin went over to Jerusalem, the House of David, and to Judah, back in the days of David, they went over thoroughly and completely. They became a light for all practical purposes to the House of David. They became for all practical purposes converted, and they never gave up their role. Esther was queen married to Ahasuerus the king of Persia. The Persians were Gentiles. The Benjamites were dealing with Gentiles to save Judah some 400 years before the birth of Christ. They saved Judah, who ought to be perpetually thankful for what the Benjamites did through Mordecai and Esther (of course it was God) in saving them as a nation. Indeed, they are thankful because to this very day every year the Jews still keep the feast of Purim, which is about 30 days prior to Passover, as mentioned in the Book of Esther to be commemorated. How did Benjamin save Judah? They saved them by coming in contact with the Gentiles, the Gentile Persian kings and others. That is what Benjamin did for Judah 400 years before the birth of Christ. Now let us come up to the time of Christ. Christ Jesus Himself was of Judah. He was of David, born into this world to be a king. He called 12 disciples. We do not read of any of them being a Benjamite so far as we know. They were all Jews. If they were of other tribes, it would have been mentioned. I have no serious doubts about it. After Christ was killed on the tree of crucifixion, He began to call another man to a particular office, not only for Judah this time but for the whole world. On the road to Damascus a man by the name of Saul, (named after King Saul, the first king of ancient Israel who was a Benjamite) was traveling to Damascus to apprehend Christians. He was going about his job with a great deal of fury and zeal. He was rounding up men, women, and children, putting them into prison, and killing them. He also killed righteous Stephen in Jerusalem. He was the Adolf Eichmann of the 1st century as far as the Christian ekklesia was concerned. He was going about with gusto to kill those who were with the House of David, the true Christ. He was trying to kill them all. He was going around like a ravening wolf. He was carrying documents from the High Priest to get rid of the people who were following the proper King of Judah, the Messiah, destroying anyone he could get his hands on. He meant well by doing it, but his efforts were wrong. On the road to Damascus he saw the vision of the Messiah. He asked, “Who are you?” The answer was, “I am Jesus whom you persecute” (Acts 9:5).I am the King of Judah. He is saying, I am the King of this world and you are persecuting Me. This was acting against the role of ancient Benjamin since the time they went with Judah and turned their backs on their natural brothers and upon power and prestige. He went into Damascus. He saw the man Ananias who put his hands on Saul and the scales came off his eyes. He first saw who he was and what he was, and what evil he had been doing. He was converted there. His name was changed from Saul (a Benjamite name) to Paul, which means “little,” little in God’s eyes. Paul was a Benjamite and he makes mention of it in two places in the Bible in Romans 11:1 and in Philippians 3:4–6. Upon his conversion Paul had turned his back on his brothers in one way. He turned his back on power and prestige. He turned his back on everything worldly that would have given him something in this world, and he started to follow the Christ, the Messiah. His forefathers did the same thing in the days after Solomon, turning their back on their natural brothers, on power and prestige, on wealth, and a try for the throne, everything, in order to stay with Judah, with David. They have been a light to David ever since. In the time of Jeremiah God allowed them to leave Judah for their own protection and have physical salvation. Yet Benjamin still stayed with Judah and they went through captivity together. In the time of Esther, Benjamin saved Judah again. Now we come to the time of the apostle Paul. In the Persian period Esther along with Mordecai was able to save Judah by influencing Gentile Persians. What was this Benjamite Paul here to do? Paul was to be the apostle to the Gentiles. He was trained in the city of Tarsus which was a Gentile area. He knew the Gentile world backwards and forwards, but he was also trained at Jerusalem and he knew Judaism backwards and forwards. No man living in the 1st century was more qualified to carry out the mission of evangelizing the world — and Judah too — than the apostle Paul. Do you know what will happen in the future? Paul wrote 14 epistles of the New Testament, more than anybody else, and he was a Benjamite. Though his mission was to the Gentiles, it also says that he was to go to Israel, which he did in his earlier years. He continued to go to them, and he was upset that so few would not seek the truth. In the future, when you take these 14 epistles that this Benjamite wrote, when Israel itself comes to see the truth of the Gospel, they will latch on to the teachings of Paul. Do you know what will happen to Judah? Not just physical salvation will result as it did by the Benjamite Esther, it will mean spiritual salvation for all time to come, because they listened to a Benjamite, the apostle Paul. (“So all Israel shall be saved,” Romans 11:26). If you personify Benjamin from the beginning: he started with everything against him and he was a delinquent, like a wild animal, a wolf. They were like Sodom and Gomorrah in the earlier period. Something happened when they got to adulthood. When the Temple was built in their territory, God latched on to them, and they turned their back on all natural things as a tribe. Of course, there were always rebels in the people of Benjamin, but as a tribe they stayed with, and became a light to, the House of David. They continually helped David and Judah throughout history, and when they had an opportunity (given by God) to escape at the time of the Babylonian captivity, they still stayed with Judah and went into captivity with them. It was a good thing they did, because in the time of Esther, Judah received physical salvation through Benjamin. Through the apostle Paul, who personified Benjamin, not only do the Jews finally have true salvation offered to them, but through what was written by Paul, the whole world is in debt to Benjamin through Paul. In the shoulders of Benjamin was the Temple, and there God dwelt. It is interesting how God dwelt with Benjamin from that time to now. Are we through with Benjamin? I do not think so. He is still a light to the world through the apostle Paul.